Tzipi Livni's refusal to enter Britain because she fears arrest on war crimes charges increases the number of Israeli ministers and ex-ministers who fear legal action, and is to be welcomed (British court issued Gaza arrest warrant, 15 December). 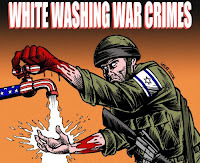 Richard Goldstone's report for the UN detailed serious war crimes and potential crimes against humanity carried out by the Israeli government in Gaza in December 2008 and January 2009. It urged international governments to take action to bring those responsible to justice. It is now almost a year since the Israeli government started its brutal and bloody Operation Cast Lead, killing over 1,400 Palestinians in Gaza. The British government has already acted shamefully by not voting for the Goldstone report at the UN. We are shocked at reports that the Foreign Office is seeking to avoid its responsibility to uphold international law and bring war criminals to justice. The statement that Israeli leaders must be able to come to Britain and that the Foreign Office is "looking urgently at the implications of this case" implies meddling with due judicial process. The government should rectify this immediately, reaffirm the principles of international law and justice, and take action itself to ensure those responsible for war crimes are brought to justice. And if the government does not act, we are ready and willing to take action.